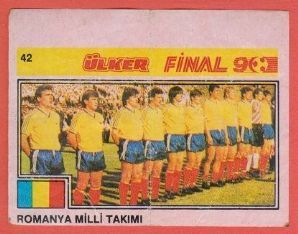 Foreign issue wax bubblegum insert, issued by Ulker under the Final 90 for the 1990 World Cup. Measures aproximately 6.7 x 8.5cm. Has the normal folds and wear from being wrapped around the bubblegum otherwise in very good condition.